This entry was posted on Wednesday, October 1st, 2008 at 10:07 am	and is filed under Encryption, How To, Passwords, Review, Security, Software, Synchronization, Tools. You can follow any responses to this entry through the RSS 2.0 feed. Both comments and pings are currently closed. While the foldershare works the thing I do with Keepass is install the ‘portable’ version on a USB flash drive. These days you can pick up a flash drive pretty cheaply and put it on your keyring. You’ll always have it with you and you can backup your db file anytime. You can get a flash drive with U3 application and download the keepass U3 version on the keepass.info site or what I do is use http://www.portableapps.com and you can find the keepass portable app available for download. 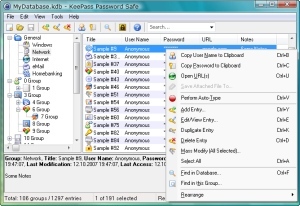 Now you can relax knowing your keepass data (while encrypted) isnt in half a dozen locations. WordPress generated this page with 42 queries, in 0.591 seconds.